42 mm stainless steel case, 14.1 mm thick, sapphire crystal back, screw down crown, rubber and stainless steel bezel, sapphire crystal with anti-reflective coating on both sides, white dial, Caliber CFB 1901 automatic movement with hour, minute, small seconds, date, chronograph with hours, minutes and seconds counters and two time zones, approximately 42 h of power reserve, black calfskin strap, folding buckle with stainless steel clasp. Water resistant to 50 m.
42 mm stainless steel case, 14.1 mm thick, sapphire crystal back, screw down crown, rubber and stainless steel bezel, sapphire crystal with anti-reflective coating on both sides, white dial, Caliber CFB 1901 automatic movement with hour, minute, small seconds, date, chronograph with hours, minutes and seconds counters and two time zones, approximately 42 h of power reserve, stainless steel bracelet, folding buckle with stainless steel clasp. Water resistant to 50 m.
42 mm stainless steel case, 14.1 mm thick, sapphire crystal back, screw down crown, rubber and stainless steel bezel, sapphire crystal with anti-reflective coating on both sides, black dial, Caliber CFB 1901 automatic movement with hour, minute, small seconds, date, chronograph with hours, minutes and seconds counters and two time zones, approximately 42 h of power reserve, black calfskin strap, folding buckle with stainless steel clasp. 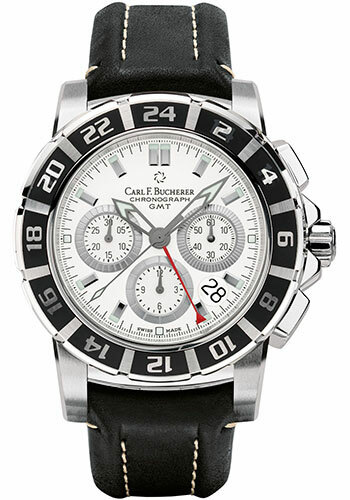 Water resistant to 50 m.
42 mm stainless steel case, 14.1 mm thick, sapphire crystal back, screw down crown, rubber and stainless steel bezel, sapphire crystal with anti-reflective coating on both sides, black dial, Caliber CFB 1901 automatic movement with hour, minute, small seconds, date, chronograph with hours, minutes and seconds counters and two time zones, approximately 42 h of power reserve, stainless steel bracelet, folding buckle with stainless steel clasp. Water resistant to 50 m.
42 mm stainless steel case, 14.1 mm thick, sapphire crystal back, screw down crown, rubber and stainless steel bezel, sapphire crystal with anti-reflective coating on both sides, blue dial, Caliber CFB 1901 automatic movement with hour, minute, small seconds, date, chronograph with hours, minutes and seconds counters and two time zones, approximately 42 h of power reserve, blue calfskin strap, folding buckle with stainless steel clasp. Water resistant to 50 m.
42 mm stainless steel case, 14.1 mm thick, sapphire crystal back, screw down crown, rubber and stainless steel bezel, sapphire crystal with anti-reflective coating on both sides, blue dial, Caliber CFB 1901 automatic movement with hour, minute, small seconds, date, chronograph with hours, minutes and seconds counters and two time zones, approximately 42 h of power reserve, stainless steel bracelet, folding buckle with stainless steel clasp. Water resistant to 50 m.